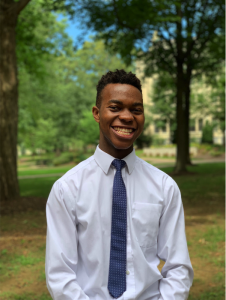 Tanaka Chingonzo ’21 shares his experiences as an international student and his upcoming project, UNRH. My name is Tanaka Chingonzo. I am a second-year at the College, a computer science major, an international student from Zimbabwe and I am an RA (resident assistant) on campus. One thing that everyone wants to know about you, how are you so happy and positive all the time? I don’t know that I’m happy all the time, or positive all the time. I was taking this psychology class last year, with Dr. [Amber] Garcia, and she was talking about this theory of emotion, which says that your emotions are a product of your behavior. There are actually studies that show that if you start laughing when you’re sad, and you force yourself to laugh, the laughter is actually going to become genuine, and you feel this uplifting in your spirit. I think that’s why I try to be positive and so on, because I think that you feel what you feel in terms of how you act. There’s also the fact that I think there’s a lot of stuff to be happy about. Like a lot of people on campus are happy. We’re all stressed out and everyone’s like, “Man, I need more sleep,” and that sort of thing, but generally I think there are more things to be happy about than sad about. This February, from the 22nd till the 23rd, a day after my birthday, I’m organizing a conference on campus for anybody who is interested in the humanities. It’s called the Undergraduate Network for Research in the Humanities (UNRH) Conference. This professor, [Dr. Jacob Heil] was the keynote speaker at last year’s conference, and so I went with him and the TA (teaching assistant). We joined the organizing committee and now we’re organizing it here at Wooster.What made you organize this conference? I initially wanted to double major in English and computer science because I feel like computer science is a really good major, but I feel it has to stand with something else. Like on its own, it doesn’t help anybody, and I don’t think it’s very practical on its own. So I wanted to look at how people talk, to analyze speech, text, books, words. In the end, computer science on its own is proving to be a load, so I’m just going to major in that. I have an interest in digital humanities, because it lets you apply all the knowledge that I’ve learned in computer science classes. I don’t know if this will interest anybody, but my initial interest was that I was using a lot of Twitter, Facebook, a lot of social media, and I didn’t feel connected to people. Their big marketing thing is connecting you to the world, or whatever, but I was using Facebook and it struck me like a paradox, that I didn’t feel connected to people. So, I was curious if I could find out the sort of conversations that people were having on social networks and analyze them, so it really looked like connections being made, like good productive conversations happening. I looked at computer science, and that would fall under network analysis and sentiment analysis of conversations. Interview by Saeed Husain, a News Editor for the Voice (Photo from Wooster.edu).